Since the adults were almost all non-local, it is tempting to suggest that we may be observing the historically described fara during migration. Regardless, this group appears to be a unit organized around one high-status, kin-based group of predominantly males, but also incorporating other males that may have some common central/northern European descent. 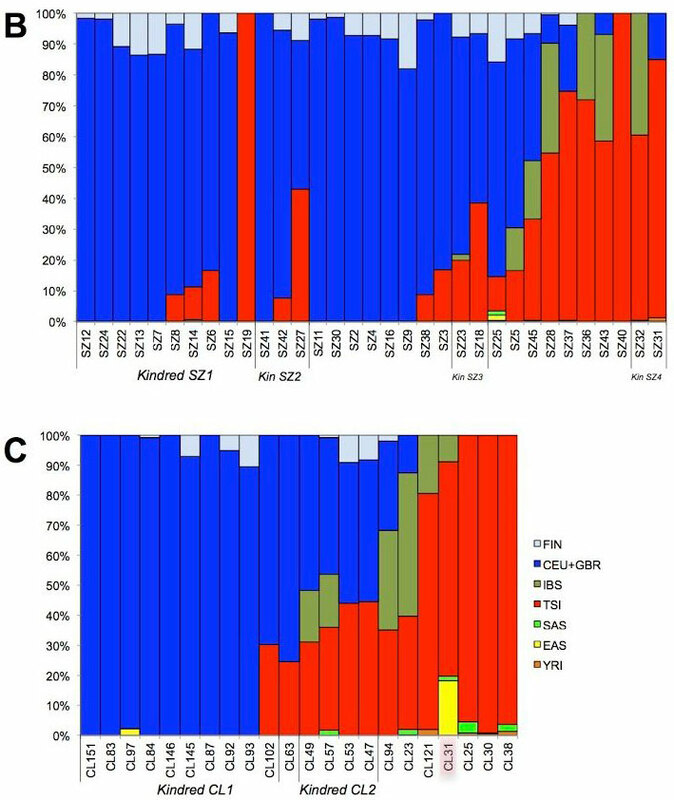 The relative lack of adult female representatives from Kindred SZ1, the diverse genetic and isotope signatures of the sampled women around the males and their rich graves goods suggests that they may have been acquired and incorporated into the unit during the process of migration (perhaps hinting at a patrilocal societal structure that has been shown to be prominent in Europe during earlier periods). 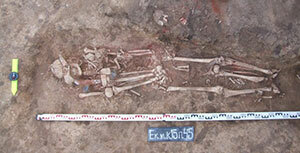 The remaining part of this community for which we have genomic data (N=7) is composed of individuals of mainly southern European genetic ancestry that are conspicuously lacking grave goods and occupy the southeastern part of the cemetery, with randomly oriented graves with straight walls. While the lack of grave goods does not necessarily imply that these individuals were of lower status, it does point to them belonging to a different social group. 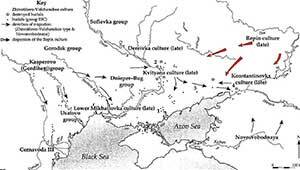 Interestingly, the strontium isotope data suggest that they may have migrated together with the warrior-based group from outside Szólád, but barriers to gene flow were largely been maintained. Genetic structure of Szólád and Collegno. 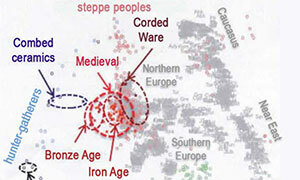 (A) Procrustes Principal Component Analysis of modern and ancient European population (faded small dots are individuals, larger circle is median of individuals) along with samples from Szólád (filled circles), Collegno (filled stars), Bronze Age SZ1 (filled grey circle), second period CL36 (grey star), two Avar-period samples from Szólád (yellow circles), Anglo-Saxon period UK (orange circles) and 6th Century Bavaria (green circles). Szólád and Collegno samples are filled with colors based on estimated ancestry from ADMIXTURE. 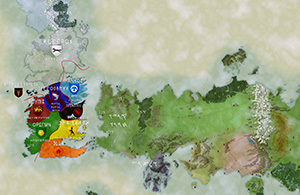 Blue circles with thick black edge = Kindred_SZ1 , blue stars with thick black edge = Kindred_CL1 , stars with thick green edge = Kindred_CL2 . NWE = northwest Europe, NE = modern north Europe, NEE = modern northeast Europe, CE =central Europe, EE = eastern Europe, WE =western Europe, SE = southern Europe, SEE = southeast Europe, HUN = modern Hungarian, HBr = Hungarian Bronze Age, Br = central, northern and eastern Europe Bronze age. 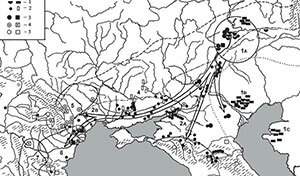 Our two cemeteries overlap chronologically with the historically documented migration of Longobards from Pannonia to Italy at the end of the 6th century. It is thus intriguing that we observe that central/northern European ancestry is dominant not only in Szólád, but also in Collegno. Based on modern genetic data we would not expect to see a preponderance of such ancestry in either Hungary or especially Northern Italy. While we do not yet know the general genomic background of Europe in these geographic regions just before the establishment of Szólád and Collegno, other Migration Period genomes from the UK and Germany show a fairly strong correlation with modern geography (while also possessing a similar central/northern European ancestry component to that found in Szólád and Collegno). 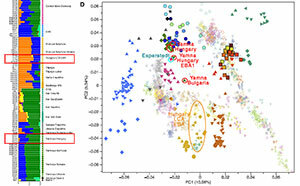 Going further back in time, Late Bronze Age Hungarians show almost no resemblance to populations from modern central/northern Europe, especially compare to Bronze Age Germans and in particular Scandinavians, who, in contrast, show considerable overlap with our Szólád and Collegno central/northern ancestry samples. Coupled with the strontium isotope data, our paleogenomic analysis suggest that the earliest individuals of central/northern ancestry in Collegno were probably migrants while those with southern ancestry were local residents. 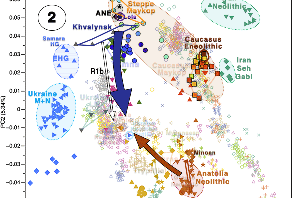 Our results are thus consistent with an origin of barbarian groups such as the Longobards somewhere in Northern and Central Europe east of the Rhine and north of the Danube. 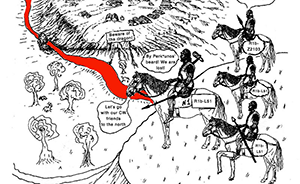 Thus our results cannot reject the migration, its route, and settlement of “the Longobards” described in historical texts. We note however that whether these people identified as “Longobard” or any other particular barbarian people is impossible to assess. Modern European genetic variation is generally highly structured by geography 22,32 , even at the level of individual villages 33 . It is, therefore, surprising to find significant diversity, even amongst individuals with central/northern ancestry, within small, individual Langobard cemeteries. 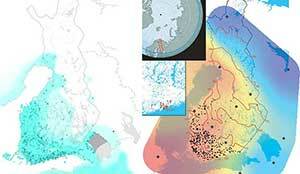 Even amongst the two family groups of primarily central/northern ancestry, who may have formed the heart of such migration, there is clear evidence of admixture with individuals with more southern ancestry. If we are seeing evidence of movements of barbarians, there is no evidence that these were genetically homogenous groups of people. 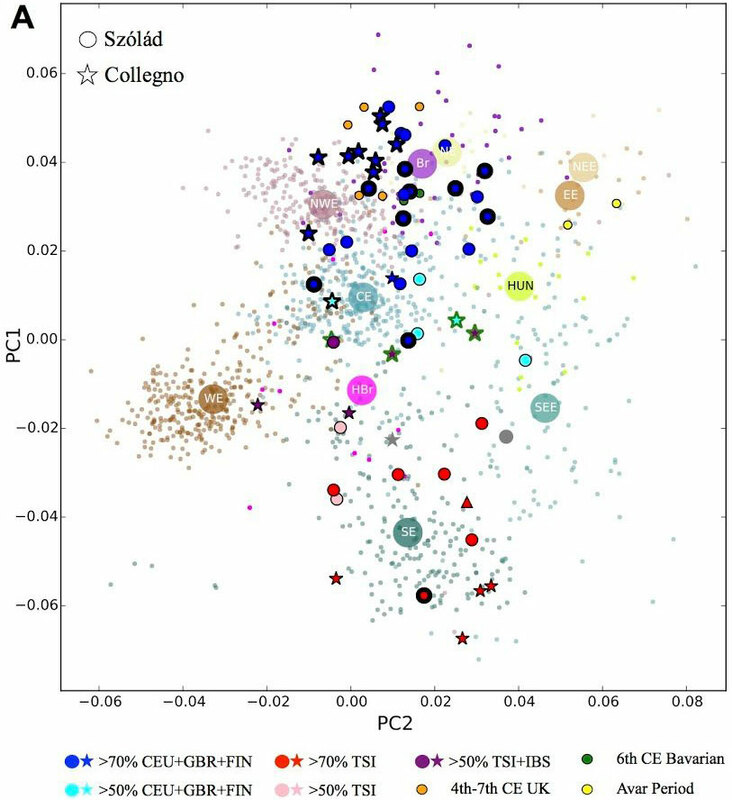 Model-based ancestry estimates from Admixture for Szólád (B) and Collegno (C) using 1000 Genomes Project Eurasian and YRI populations to supervise analysis. Note that high contamination was identified in CL31 and is shown with a triangle in the (A) and overlaid with a pink hue in the (C). 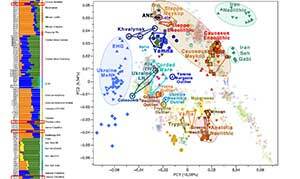 The haplogroups detected in the samples show a prevalence of R1b (55.3%), which is the most common sub-haplogroup in western Europe, with a peak in the Iberian Peninsula and in the British islands and a west-east gradient in central Europe. 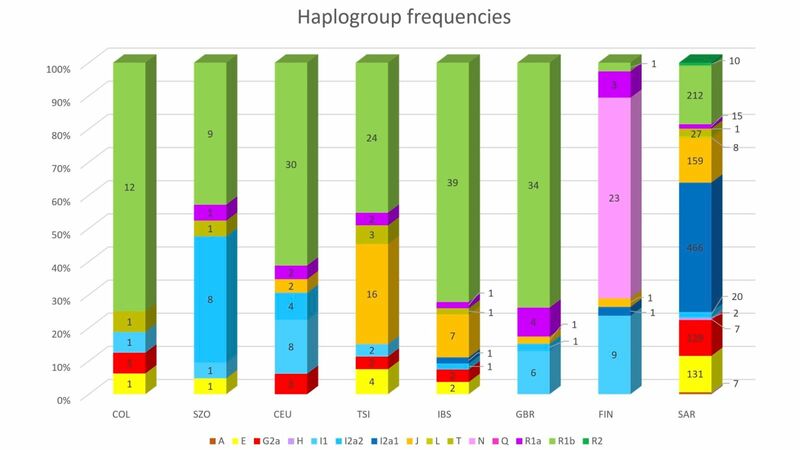 A consistent percentage of haplotypes belongs to the I haplogroup (26.4%), both in the I1a and, more abundantly, in I2a2 sub-haplogroups. They are particularly frequent in the northern Balkans with a westward gradient in central and western Europe, with some lineages belonging to I2a2a1b particularly common in the Germanic region.